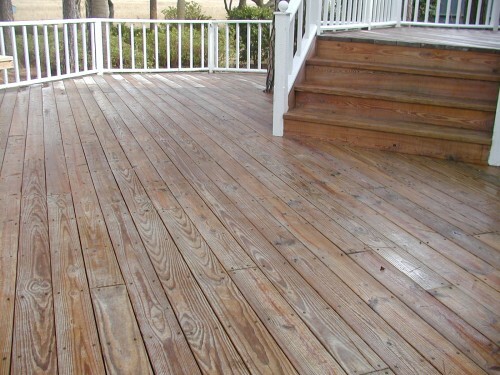 A typical deck subject to high humidity and warm temperatures without proper maintenance retains moisture within the wood leading to premature rotting and damage. Left unattended this will lead to an unsightly and ultimately dangerous condition. This can be detected by the wood members warping, bowing, cupping, splitting and/or cracking. 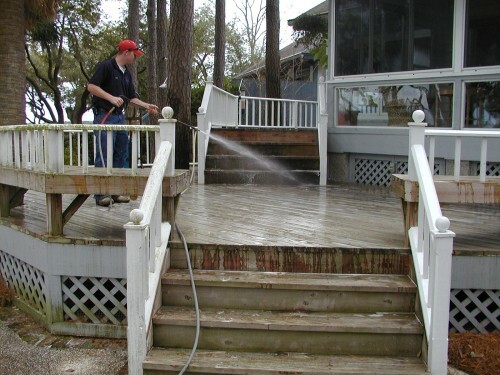 First, our five-step process begins with a low-pressure wash. Low-pressure wash is critical. 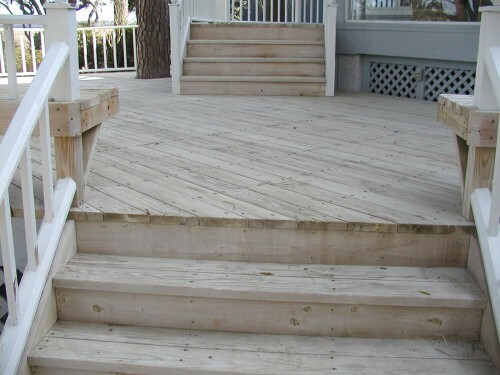 High-pressure applied to a wood surface will cause splintering by crushing the wood fibers. Second, a chemical stripper has been applied, to remove all vestiges of any previous stain, or mill glaze left by the mill when the lumber was run through a high-speed saw. 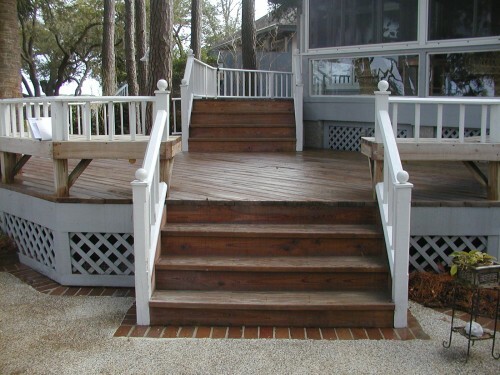 Sometimes sanding is necessary to remove certain water-based sealers. The wood darkens in reaction to the alkaline cleaner and stripper. For the optimal result, pH must be neutralized. Third, immediately after the stripping agent is rinsed off, a neutralizer is put down to balance the pH of the wood, and restoring it’s original color. Fourth, brightening and drying prepares the surface for the protecting stain to be applied. Dried and ready for staining. A moisture meter is used to ensure moisture content is below 12%. Otherwise the stain will not be absorbed to its fullest effect and is ripe for premature failure. Fifth, an oil-based penetrating sealer is applied that allows the wood to breathe. Water-based film-forming sealers can trap moisture inside during the daily dew cycle. Clear sealers are not recommended as they offer no UV protection from the sun’s harmful rays. The darker the stain, the greater the protection. This Natural Cedar color offers a nice compromise and is by far our most popular color. 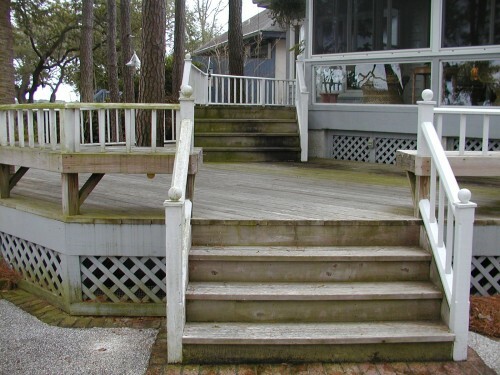 For most decks, from this point forward annual washing and every-other-year resealing is all the maintenance that will be required. 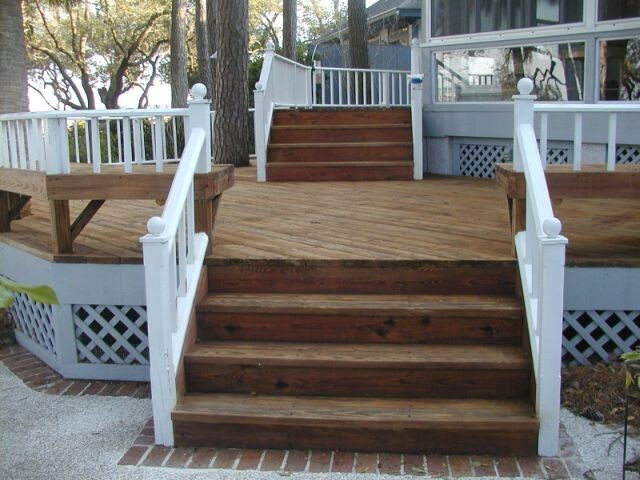 Now, enjoy your deck! !